Today I found out where the words “Crayola” and “Crayon” come from. The word “Crayola” was originally thought up by Alice Binney. Binney, a one-time school teacher, combined the French word “craie”, meaning “chalk”, with “ola”, shortened from the French word “oléagineux”, meaning “oily”. Oléagineux derives from the Latin “oleāginus”, which is the adjective form of “olea”, meaning more or less “olive tree”. The French “craie” comes from the Latin “creta”, which also means “chalk”, and, in addition, can mean “clay”. Craie is also where “crayon” gets its leading “cray”, though the word “crayon” existed long before Crayola crayons were invented. It first appeared around the 16th century in the French language and meant “chalk pencil” and later just shortened to “pencil”, as it still means today. Hence, given the origin of the words, “Crayola crayon” more or less just means “Oily Chalk Pencil”. Alice Binney’s husband, Edwin Binney, along with his cousin, Harold Smith, founded Binney & Smith in 1885. Binney & Smith originally produced various pigments, such as chemicals used to make tires black (which drastically increases the durability of the tires over natural rubber, which is white) as well as red iron oxide pigment used in the now classic red barn paint. In the late 1890s and early 1900s, Binney & Smith began developing product lines for schools and children to use. This began after they purchased a stone mill company and started making slate pencils for schools. With that line of product performing well, they then focused on educational products targeting specific needs in classrooms of the day, likely getting ideas from suggestions from Alice Binney who was once a school teacher. These products included the world’s first dustless chalk, called “chalk crayons”, for which they won a gold medal in the 1904 St. Louis World’s Fair, and, of course, the wax crayon sold under the “Crayola” brand beginning in 1903. The wax Crayola crayon itself was simply a modified version of an industrial product Binney & Smith sold, typically used to mark crates and barrels. This original industrial wax crayon, however, was not safe for children to use as it contained certain toxic chemicals to achieve the necessary colors. They soon found ways to modify the ingredients to make them kid-safe, using non-toxic pigments, and began marketing these wax based crayons to children (with wrappers around the sticks) and to artists (without wrappers). Today, Binney & Smith, which in turn owns Crayola, is owned by Hallmark Cards Inc., who purchased Binney & Smith in 1984. Edwin and Alice Binney’s daughter Dorothy was once married to publisher George P. Putnam, who would later marry Amelia Earhart. The gold medal Binney & Smith won in the 1904 World’s Fair is why they started putting a gold medal design on their product packages, something that they continued to do into the 1950s. Edwin Binney and Harold Smith formed their company from Edwin’s father’s Peekskill Chemical Works company, which Edwin’s father, Joseph Binney, retired from in 1885. Only three Crayola crayon colors have had their original names changed in the company’s history. Those were: Indian red (to chestnut) in 1998; Prussian blue (to midnight blue) in 1958; and flesh (to peach) in 1962. In order to properly light sets on movies, carbon-arc lamps were once used. These lamps contained graphite electrodes that were called crayons. The first “crayons” were made in Ancient Egypt, though not in the form we have today. The Egyptians combined beeswax with various colored pigments. These were then used to write and paint on stone. Once the writing or image was made on the stone, they’d use a strong heat source on the design, which would embed or “burn” it in the stone. 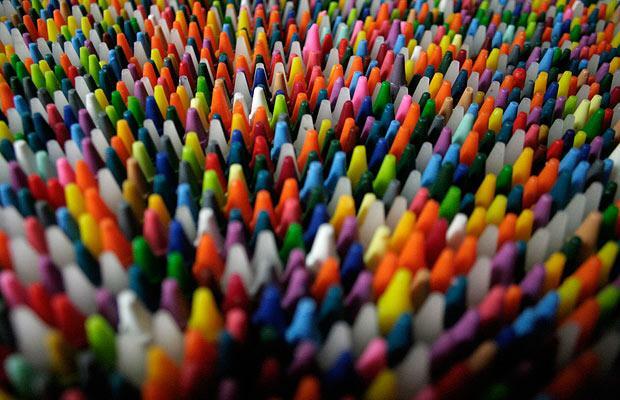 The first crayons resembling the modern crayon were made in Europe. They were originally made out of charcoal and oil mixed together, but the charcoal was soon replaced with various pigments in powdered form to allow for different colored crayons. Finally, they ceased using oil and used wax instead, as it was easier to work with and provided a stronger writing stick. The 100 billionth Crayola crayon was produced in 1996 and was molded by Mr. Rogers in an episode of Mr. Rogers’ Neighborhood. 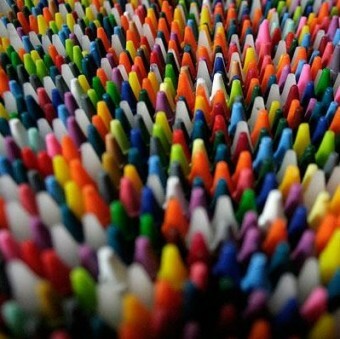 The largest Crayola crayon ever made was 15 feet high, 16 inches in diameter, and weighed around 3/4 of a ton. It was created for the company’s 100th anniversary. The original colors in the first box of eight Crayola crayons were: black, brown, blue, red, purple, orange, yellow, and green. These first boxes of crayons sold for a nickel. The largest crayon set sold by Crayola is the 832 pack, which is sold primarily to schools. The largest pack with unique crayons (based on color and additive like glitter), is the 200 pack. Binney & Smith Inc. continued to produce industrial pigments until 1955 when they sold their Pigment Division to Columbia Carbon Company. Oléagineux in turn gave rise to the English word oleaginous, which also means “oily”. The Crayola brand is said to have a 99% name recognition in the United States. Further, according a study done at Yale University, the smell of Crayola crayons is the 18th most recognizable scent to adult Americans. The top two most recognizable scents in that study were coffee and peanut butter. Binney & Smith not only owns Crayola, but also owns Silly Putty, which they acquired in 1977. The Smithsonian Institute added the Crayola crayon 64 count box to their permanent collection in 1998. Two years later, Crayola got another one of its products inducted into a Smithsonian collection, when Silly Putty was inducted into the Material World collection. One year after that, Silly Putty was inducted into the Toy Hall of Fame. The Crayola crayon was inducted into the Toy Hall of Fame in 1998. The motivation for creating Silly Putty was to create a synthetic rubber substitute. The Allies were desperately short on rubber during WWII thanks to Japan invading various rubber producing countries in the Pacific Rim. The first inventor of Silly Putty is up for debate, but Crayola states that James Write, working for General Electric, invented it in 1943, though there were a couple others who independently invented it around the same time period. Silly Putty didn’t make a good rubber substitute and didn’t appear to be good for anything else, even after Write sent samples of it to scientists all over the world to try to see if they could find any use for it. It wasn’t until 1949 that a toy store owner, Ruth Fallgatter, got a hold of it and decided to sell it as a bouncing putty toy. The name Silly Putty wasn’t coined until later when Peter Hodgson, the marketing consultant that had helped Ruth Fallgatter produce her catalog, decided to sell it in the now classic plastic egg shells. At the time, he was $12,000 in debt and, given how well it had sold for Fallgatter in her catalog, figured it would do the same for him. Within three days he had sold nearly 1/4 of a million eggs of Silly Putty at $1 an egg. Interestingly, Silly Putty dissolves in alcohol. Because of this, alcohol-based hand sanitizer is often the best way to get the putty out of hair or clothing. WD-40 also works well for this. Among a lot of other things, Silly Putty makes a great fire starter as it burns fairly easily and slowly, as well as gets white hot. Silly Putty was one of the things taken into lunar orbit in 1968 during the Apollo 8 mission. Are you sure Crayola didn’t just get its ‘cray’ directly from ‘crayon’? I find it suspicious that Crayola’s creator actually had ‘craie’ in mind when thinking up the name.